A fabulous soup for a fabulous fall day. Creamy, cheesy, delicious. 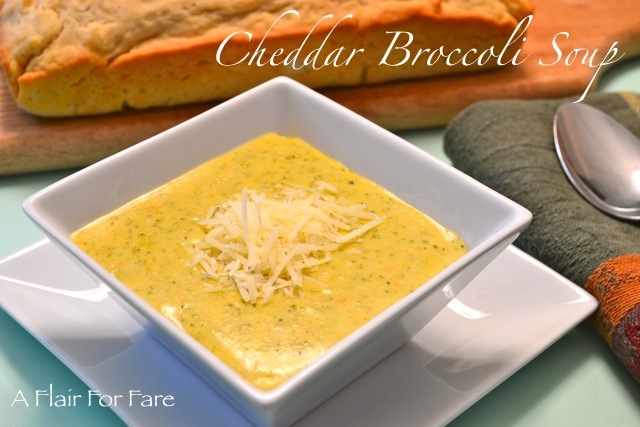 Even if you are not a big fan of broccoli, you will love this soup. Puree it smooth or leave it chunky; the choice is yours. Great as a sandwich side or main dish. 1/4 teaspoon nutmeg, freshly grated if you have it. In a large dutch oven or soup pot, melt butter and sauté onions until soft. Add flour and cook 3 minutes, stirring constantly. Whisk in half and half until smooth and creamy. Add nutmeg, broth and bay leaves. Add 1 teaspoon kosher salt and 1/2 teaspoon freshly grated pepper. Simmer over medium low heat 20 minutes. Add broccoli and carrots and continue to simmer another 20 minutes, until vegetables are tender. Remove bay leaves and puree in a blender. (or in pot with immersion blender) Leave in some chunks of broccoli if you wish. Return soup to pot and add cheese. Stir over medium heat until melted. Add more salt or pepper as needed. Garnish with additional grated cheese. Serves 4. Goes great with sourdough or beer batter bread.